Terre Neuve is a remote village located 23 km (15 mi) north of the mountains outside Gonaives, Haiti. Traveling from Gonaives can take 2 hours as the roads and mountain passes are difficult to navigate. Essential supplies are hard to acquire. The majority of villagers food and supplies are through agriculture and trade at the local market. (3.2 km (2 mi) walk through mountain passes) There is little to no presence of evangelical Christian gatherings in the area, with the majority adhering to VooDoo belief systems or Roman Catholic traditions of worship. The school has operated in the new space for close to one school year full year. 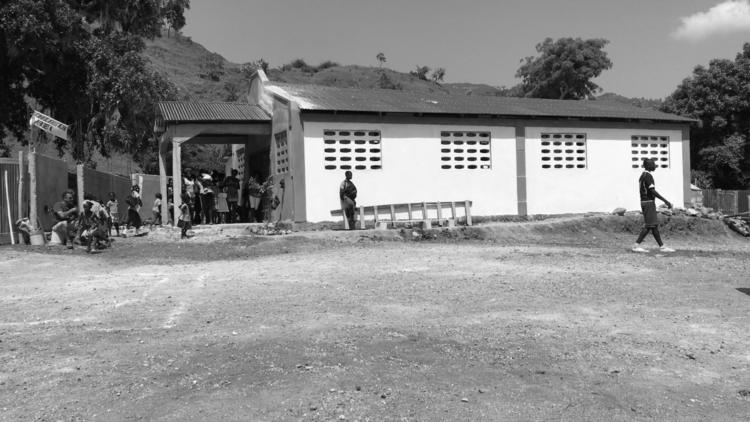 The school grew by 30 students, and the church has increased by more than 75 individuals. Pastor Simon has recently opened a second location further into the mountains due to the distance traveled by the students daily. We are excited to share this location with you soon. We are focusing on improving this facility as the enrollment of students has increased as well as the bread program. Improvements to the facility will include building latrine (boys and girls bathrooms), building chalkboards and student benches, painting the walls with cartoon characters in classrooms, purchasing teacher uniforms, and landscaping. Building the latrines will create sanitary conditions for students and teachers. Building chalkboards, benches, painting the classroom walls, and landscaping will create exciting learning environments. Purchasing teacher uniforms will create a sense of unity and will model professionalism for students. The school and church are now built leaving some minor finishing work. The benches made for the church and school employed three carpenters. The church community is thriving with local outreach, seeing more than 75 people decide to follow Christ, ten couples choosing to get married, and more than 30 individuals saying yes to a public declaration of their faith through baptism. Elevating Christin Ministries committed to construction and began building a foundation around the existing structure with local masons. There was considerable challenge transporting building materials through the mountain passes. This project employes 15+ local carpenters, masons, and construction workers. It gave life and economic stimulus to a community that has not seen improvement in many years. The original church building was a school through the week. The structure was made of local hand-cut lumber and repurposed tin from a refuse pile. The members of the church carried rocks from the local riverbed to create the beginnings of a foundation. On going monthly support is out first priority to fighting hunger in the village of Terre Neuve. The feeding program each month costs $275 to feed 80 children ages 3-18. The teachers in Terre Neuve are essential to the education and the attendance of the children in school. In past, the teachers have sometimes gone without pay when funds are tight. They are commited to educating children and have continued to be be faithful in their calling to the children. ECM saw the need, and stepped in to support in 2017. The school director and six teachers salaries each month are $450. Simone Romain, one of our most influential leaders on the ground in Haiti is Simon Romain. He is a trained educator and serves the village of Terre Nueve as a Pastor and School Director. He has attended seminary classes and continues with local pastoral training quarterly throughout the year. He also is working to develop a regional income project. He provides for his family through teaching while balancing ministry in 3 remote locations across the region. Terre Nueve, Gonaives, and Sarasin. He and his wife invest person capital into the projects from their full-time jobs in education. He is now traveling three days a week to the various location, often staying overnight in remote areas to be ready to serve the following day. His only method of transport is the motorcycle that ECM has provided and TapTap for longer trips. Simon has donated land to ECM in return for the church building. Together we are in the beginning stages of a chicken and egg business. The long term goal is that the profits will support the operating costs of the church, school, and feeding program. Peter & Jill Farrell said 'YES" to Haiti in February of 2018. They are actively making a difference to fight hunger by leading a campaign raising awareness back home in the USA. As ambassadors of ECM, their teams support directly impacts Pastor Simone and the feeding program in the village of Terre Neuve. Join their team and fight hunger!